ExploraVision is a competition for K-12 students to combine their imaginations with the tools of science to create and explore a vision of a future technology. Students work in groups to select a technology to explore what the technology does, how it works, and how, when and why it was invented. The students then project into the future what the technology could be like in 20 years from now and determine what scientific breakthroughs need to occur to make it a reality. ExploraVision is part of the curriculum for Felicity-Franklin’s Byways Gifted Program. Next up is the Nationals! Students will create a prototype and website with a video that communicates their project idea by April 7th. Judges will choose 1st and 2nd place winner that will have the opportunity to travel to Washington D.C. for Awards Weekend. The 1st place team will receive a $10,000 Savings Bond and 2nd place a $5000 Savings Bond. In addition to having a Regional winning team, we also had two teams that received honorable mention which means their projects were considered to be in the top 10% of the projects turned in this year. This means these two projects were in the top 500 of the 5000 projects turned in across the nation. In grade 2, Jack Robertson, Jaden Baker and Ronnie Bullock-Wilson received honorable mention for their Lego 3D printer which is a 3D printer that prints any Lego you need. 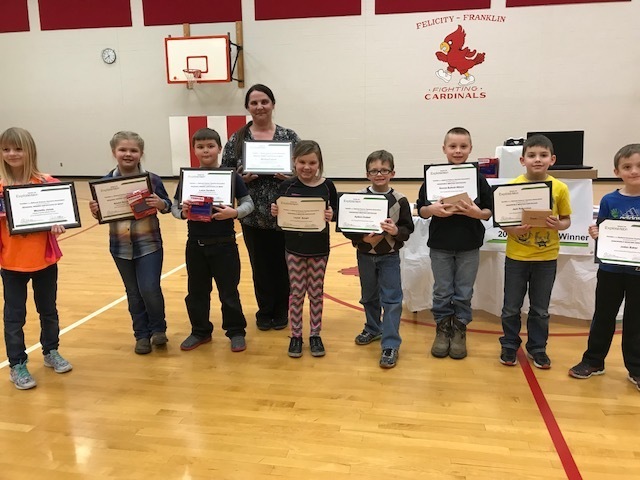 In grade 1, Aydenn Kretzer and Laylah Barger received honorable mention for their Super Lapbelt, which is a replacement for our seatbelts of today.